Earwax, also called cerumen, is made by the body to protect the ears. The ear wax has both lubricating and antibacterial properties. Most of the time, the old ear wax is moved through the ear canal by motions from chewing and other jaw movements and as the skin of the ear canal grows from the inside out. At that time, it reaches the outside of the ear and flakes off. Earwax is produced in the outer part of the ear canal, not deep inside the ear. We say that earwax is impacted when it has built up in the ear canal to such a point that there may be signs that something is not quite right. It is important to note that, for most people, ears might never need cleaning — they are designed to clean themselves. Earwax buildup and blockages often happen when people use items like cotton swabs or bobby pins to try to clean their ears. This only pushes the earwax farther into the ears and can also cause injury to the ear. The Hear4U Team will try to remove your earwax the same day. You do not have to put oil in for weeks and weeks in advance. However, we do advise using an olive oil spray for at least 3 days prior to your appointment. 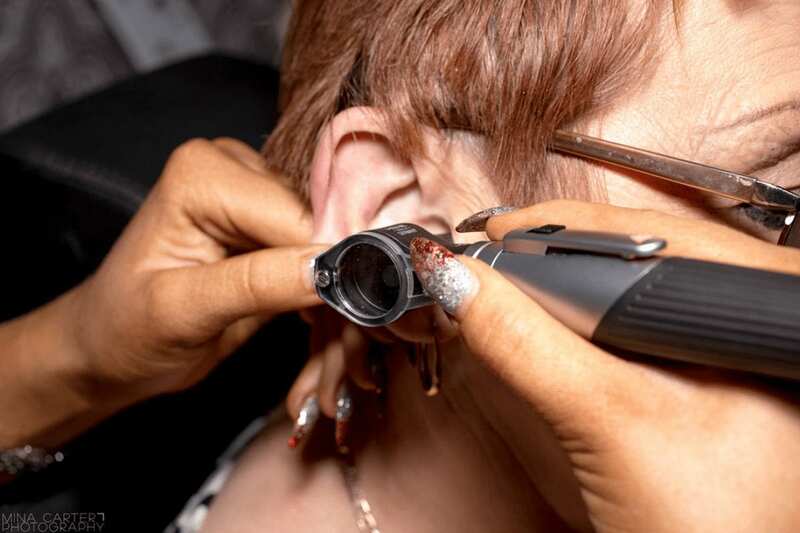 At the Hear4U Hearing Aid Centres, we offer a relaxed atmosphere, allowing sufficient time for all our patients to remove wax in a safe and gentle way. We also offer an on-screen video image of the wax in the ear and the cleared ear after your treatment. We can also provide this service at your home if you are not able to access our Hearing Aid Centres. If you would like same-day Earwax Removal, get in touch! Call us to arrange an appointment at any one of our clinics. We will always suit your needs, that’s a Hear4U promise! For all Earwax Removal appointments, we require a £30 non-refundable deposit payment. Please turn up to your appointment 5 minutes before to complete your medical form. We allow 15 minutes grace period should you have no wax, we will then provide a hearing assessment if necessary and a medical referral (if required). The £30 payment is for our time, not for a given procedure. If you need to come back for a second appointment, there is no charge. If a third appointment is required, another £30 will need to be paid. Should you wish to avoid this extra charge, we strongly advise putting olive oil into your ear at least a few days before your appointment. If you need to cancel the appointment or reschedule, you must do so within 24 hours of your given appointment. If you need to reschedule, please make sure it is 24 hours before, otherwise there will be the customary £30 charge for another appointment.